I’m not really a fan of the Nintendo 64. It was cool when it first came out back in 1996, but it doesn’t really hold up today. I have an EverDrive 64 flash cart, which gives me access to the entire N64 library. Whenever I scroll through the list of games I always think to myself, “There are no good games on here.” Sure there were the Nintendo first-party classics such as Super Mario 64 and The Legend of Zelda: Ocarina of Time, but the majority of games on the list are unmemorable shovelware at best. The 3D capability of the system does not hold up very well at all. Most games ran at 240p, and had a poor frame rate. This resulted in jagged lines on the polygons. The games that did run in 480i, such as Star Wars Rogue Squadron (if you had the 4 meg memory expansion), didn’t fare much better. Textures also had poor shading that looked like a checkerboard pattern. If you want to go back and play Ocarina of Time or Majora’s Mask today, I recommend you play them on the Wii Virtual Console instead. The resolution has been bumped up to 480i and the textures are nice and smooth. What’s sad though is that the console would have made a fantastic 2D platform. What it lacked in the 3D department it made up for in raw processing power. The system was more than powerful enough to handle perfect arcade ports of 16-bit games. The port of Bust A Move (Puzzle Bobble in Japan) was fantastic. 2D games were few and far-between though. Most developers who were still interested in developing 2D games had jumped ship to PlayStation or Saturn. This made sense seeing as pressing CD games was far cheaper than producing cartridges. If you were going to develop for the N64, you needed to utilize it’s 3D capabilities, otherwise it didn’t make sense to use. I still keep my N64 around to use on occasion whenever I’m feeling nostalgic. And like my other consoles, I’m a stickler for having the highest quality video possible. Which brings us to today’s acquisition. 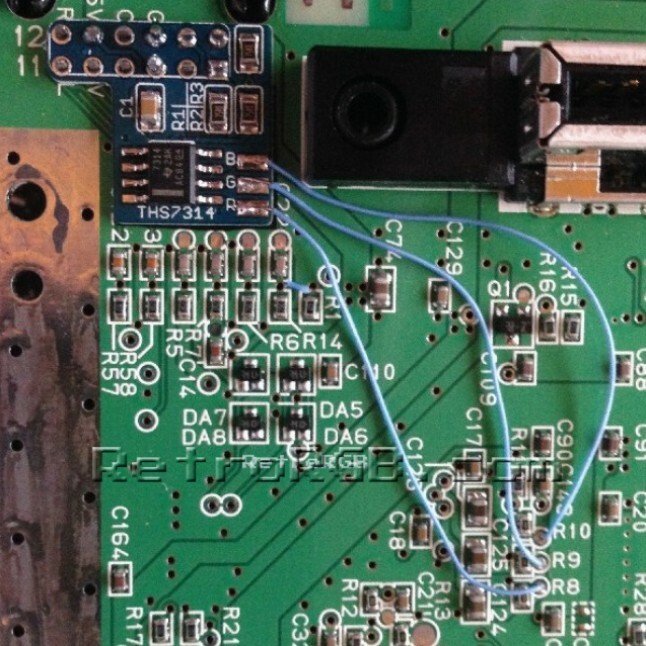 The N64 uses the same custom AV out port that the SNES used, but for whatever reason, the RGB pins are not connected to anything on the PCB. I guess Nintendo decided they wanted to save a whole 6 cents per console by doing this. RGB still exists on the PCB, but you have to wire it in yourself. The problem though is that the RGB signal is not strong enough on it’s own. If you wire it up directly the image will be so dark you won’t even see anything. You have to add an amplifier to boost the signal. Enter the RetroRGB amp. 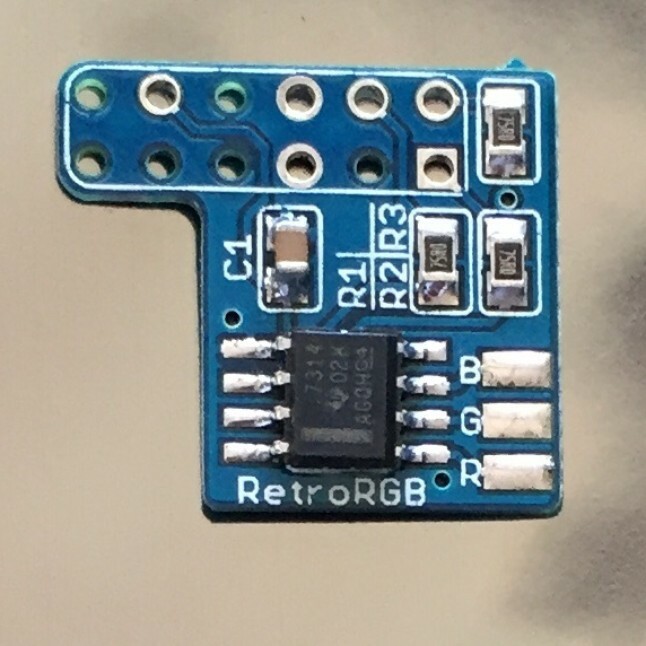 This genius little board, the size of a nickel, fits directly on top of the pins of the N64’s AV out connector and amplifies the RGB signals. You still have to run three wires from the board to the points on the PCB where RGB is tapped, but it’s an easy job. Pictured is the completed installation of the RetroRGB amp on the bottom of an N64 PCB. Once installed, you can use your same SNES SCART cable for this as well.